The date hits my Outlook Calendar faster than you can say “Waikiki Beach.” My friend Ms. Zany, the Queen of the Office Theme Party and her partner-in-crime Mad Me-Shell are at it again. They’ve scheduled the second annual celebration of Hawaiian Shirt Day. If this festive occasion doesn’t ring a bell, you’re not alone. It’s not a Hallmark card holiday. Zany made it up. The corporate dress code gets tossed out the window. The required uniform is a gaudy Hawaiian shirt – the cheaper, the better. We immediately get to work on an authentic Hawaiian menu for the celebration. And, it turns out that “authentic Hawaiian” can be pretty loosely interpreted. We settle for “mainstream Hawaiian” which means lots of pineapple and coconut. Forgive us. It’s the summer. It’s the silly season. There is a grand tradition here. In the 1950s, faux-Hawaiian was all the rage. It was the era of Trader Vic, shrimp sates and Mai Tais. All one needed was a pineapple and a few toothpicks, and one could embark on an exotic culinary adventure right at home. Of course, I get the dessert assignment. So I dive headfirst into the Internet to see if I can retrieve a few pearls. I come up with Hawaiian Wedding Cake. Whether or not Hawaiian Wedding Cake is genuine ethnic food, or was ever served to celebrate nuptials is debatable at best. But, the recipe leaves a blissful trail of crumbs throughout the Internet and has clearly been a longtime favorite for potluck dinners, brunches and church cookbooks. A quick blending of crushed pineapple, shredded coconut and walnuts dressed in cream cheese frosting produces a sweet, textured sheet cake rich with tropical flavors and nutty complexity. It is certainly reflective of the stalwart tradition of convenience cakes. Any recipe that calls for a 20-ounce can of crushed pineapple is surely not from the Jacques Torres School of pastry. I do find a separate Hawaiian wedding connection. 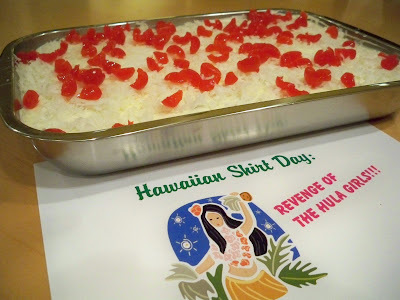 There is an authentic Hawaiian dish called Haupia, a coconut-based dessert that is similar to a gelatin and is served in squares. 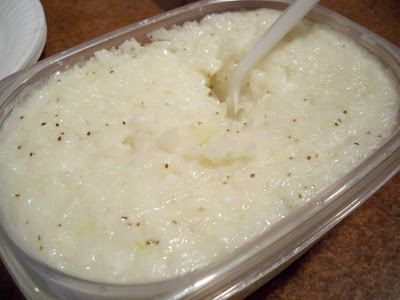 Haupia is also used as a topping for wedding cakes in Hawaii. Perhaps my “suburban-style” Hawaiian Wedding Cake was an attempt of mainlanders to emulate this island tradition, using easily-purchased supermarket staples. 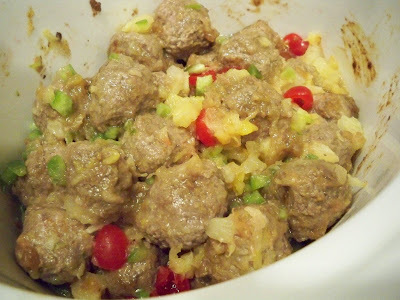 Aloha Meatballs, bejeweled with green peppers and maraschino cherries …. Mad Me-Shell conjures up a SPAM cheese ball, an orb so perfectly round and imposing that it looks like one of the outer planets of the solar system. 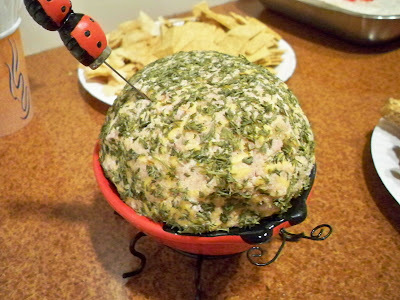 Perched in a festive lady bug serving dish, the SPAM cheese ball is savory with just a hint of smoke, and reminds me of the luscious deviled sandwich spreads of my childhood. I know my regular readers may have a hard time seeing “the S-word” in one of my posts. Now, don’t go sending me hate mail or anything. There is some serious culinary history behind Mad Me-Shell’s menu selection. You may not realize that SPAM is a bit of a gastronomic phenomenon in Hawaii. Introduced during the military occupation of World War II, SPAM is still so popular that it is sometimes referred to as “Hawaiian Steak.” Residents of Hawaii consume the most SPAM per capita in the United States. Credit Mad Me-Shell with both authenticity and audacity in her choice of a canapé. 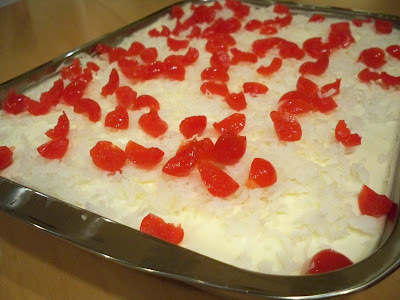 The banquet concludes with the Hawaiian Wedding Cake, a majestic sea of coconut whitecaps, where glistening maraschino cherries bob gently. Zany and Mad Me-Shell are flush with the excitement of a tropical island holiday. You can almost hear the strains of the ukulele and feel the warm ocean breezes wafting through the conference room. Can the hula girls be far behind? The only disappointing thing about this post T.W. is that there is no picture of you in your teal green shirt! The Wedding Cake looks yummy. Colette, just for being kind enough to ask, I am going to send you a fine picture of me in my special Hawaiian Shirt! Who wouldn't love that Hawaiian wedding cake? 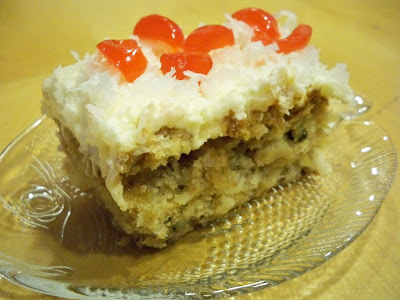 I for one cannot resist any dessert with pineapple and coconut in it. What fun you all must have had at your Hawaiian Shirt Day feast. IMHO you can't have an authentic Hawaiian menu without including the "S" word. I may be a bit prejudice, but your cake looks the BEST! Are you sure no hula girls popped out of that cake? I'm also joining the movement asking for a photo of you in the Hawaiian shirt! Sounds like a fun time. Much more fun than the rather boring parties we have at the school where I work. 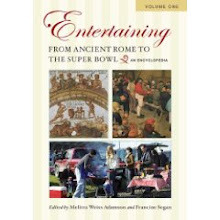 I bet a fun time was had by everyone in your office. The food looks yummy. My daughter has given up trying to make haupia from scratch for our annual luau, now she uses a mix. What an absolutely wonderful idea. And some delicious looking food to go with it. That's just great! I can feel the tropical breeze from here in Seattle! :-) My only regret is that I am already married so a Hawaiian Wedding cake isn't needed at any point in the near future. But would it be so wrong to have a wedding cake from a different culture each anniversary from here on in? Looks like it was an absolutely fantastic--spamalicious-- party! Susan -- that would be, T.W. Bahama. Louise -- this cake was a hit. We feasted on it for two days - sort of like a never ending luau! Kalyn -- Zany is our party planner extraordinaire! She's already planning the next event. 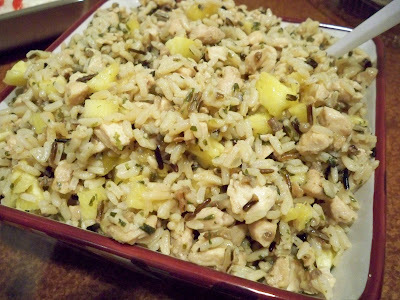 Hi Rochelle -- I'm curious to try haupia - maybe I can find the mix. Tom - Welcome! Did I mention the grass skirt? Hi Cakespy - I think you've come up with the perfect anniversary celebration! Is your "better-half" a baker? I think the next cake should be made from... SPAM! Your cake was phenomenal, as always! Next on the list - a better grass skirt! We got ripped off. Mad Me-Shell - A SPAM cake! I love a good challenge. My pastry chef would have a stroke! Actually Haupia on Wedding Cakes are a rather new inception. It started to become popular in the mid to late 90's. The "Hawaiian Wedding Cake" recipe definitely predates this. Wedding Cakes in Hawaii were and are essentially the same as the rest of the country though flavors like Banana, Carrot or Prune cake have long been favored. Now Guava, Passion, and Haupia have been added to these. I think Hawaiian Wedding Cake is a new type of wedding cake idea. You give here some helpful information about Hawaiian Wedding Cakes. Its nice and useful to cake lovers.